In the only camp at the beach Liptovska Mara everybody can find their own individual fun or relaxation experience suitable for themselves. With 500 horse power under the hood your captain will guarantee you an unforgettable experience. 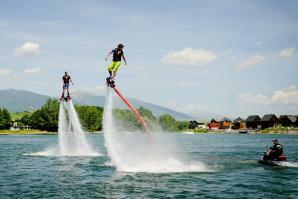 You can also ride on water scooters, or just try straight away wakeboarding or water skiing. Then you can enjoy a well-earned rest on comfortable pedal boats, kayaks and stand-up paddles. Friends can fairly measure their strength in Aquazorbing or bumper football. The smallest ones will have fun on boats in a safe area of our pools.